Originating in Japan in the 1900s, lesson study is based on a collaborative model of plan, teach, observe, evaluate (Makinae 2010). The observation focus is on pupil learning rather than teacher behaviour. It uses collaborative approaches to look at learning as it happens within a classroom. It encourages teachers to use educational research in their planning and teaching. It turns teachers into researchers as together they identify and examine particular lesson focuses and then share their findings with colleagues. It helps to inform and refine whole-school ideas about what makes effective teaching and learning in an individual school’s context. Based on published research, a school policy or school data, or your own mark book, concerns or observations, you identify an area for development in students’ learning that you want to address within one of your classes. Working with a couple of other teachers, you discuss your chosen study, look at possible pedagogy, and plan the first lesson. In this phase you need to choose three representative “case pupils” to form the basis of the study. One of you teaches the planned lesson, the others will observe the lesson focusing on the agreed lesson study topic and the three pupils. Afterwards evaluate the study, with feedback from the three pupils and observing staff. 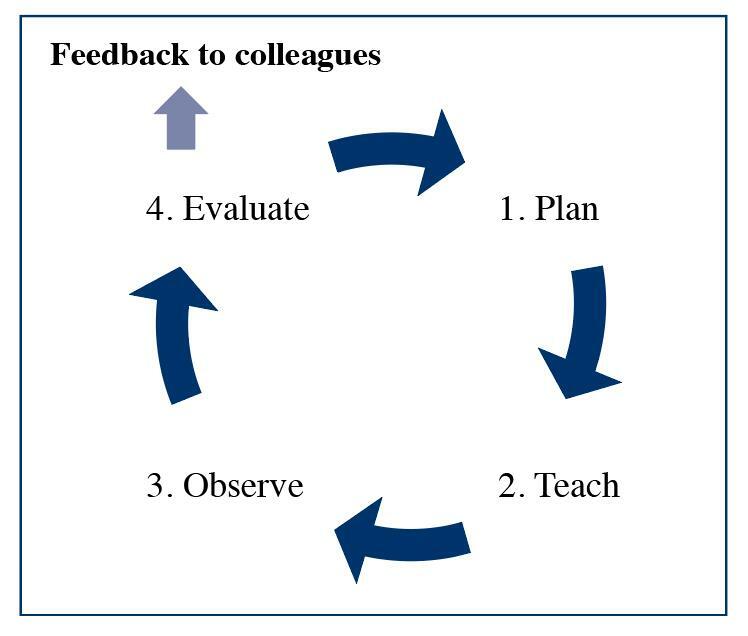 With the feedback to inform you, plan the next lesson and continue moving through steps 2 to 5 until the cycle finishes. Feedback your findings to colleagues. At heart lesson study is a collaborative way of evaluating and refining lesson design, content and delivery. It is a positive and inclusive way for teachers to implement and evaluate whole-school initiatives. It lends itself to a useful look at whole-school systems based on a “principles” rather than “policies” approach. The “hard yards” of the lesson study process are often in the setting up. The following will help you reflect on how best to approach the planning stage. Before you start linking with colleagues, consider two points. First, why do you want to undertake the lesson study? This could be to identify and remedy a challenge pupils have with learning, or a challenge you have as a teacher, or a chance to introduce research findings into your teaching. Second, what exactly is it that you want to study? Look for one tight focus such as EAL engagement, the achievement of high-ability pupils, whole-school literacy policy in action, or exam and revision techniques. You will be using data gathered from one of three sources to inform your lesson study: your classroom, whole-school policy, and academic research. If you are using classroom data from your mark book or from your observations, be clear about what need the information is identifying that would make a good lesson study. Classroom data is best used when it provides as an overview across a period of time. If you are going to use whole-school policy to generate a lesson study, think very carefully about which year group to target and when. A policy that has been running for a number of years is probably best for a lesson study in years 6 or 9 so you can see its impact over time. If your school has recently implemented a new policy, it might be good to set up a lesson study lower down the school in years 4 or 7 and feed the findings into any developmental reviews. This will help the school assess the new policy as your lesson study findings will be valuable to the process of review. Using education research as the basis for lesson study often leads to a more in-depth study. The fun part is reading around current research and deciding which area you want to know more about (Twitter can be very useful for this, as are any of the mainstream educational publications and blogs). Once you have selected the area, become a mini-expert. Read everything you can lay your hands on. This in itself is fabulous CPD and has considerable potential – colleagues setting up research-based lesson studies have been inspired by contacting the relevant academics and authors of the initial research. Once you have identified what you want to address, develop or explore, you next need to identify the four Ws: When best to undertake the study, Which colleagues to work with, Which class, and Which three “case pupils”. Choose the “best-fit” colleagues, given your lesson study focus. Usually a trio of teachers works together, but there is some flexibility here. Two or four could also work. You may need colleagues from different subject disciplines working together, or wish to include the teacher responsible for a whole-school policy as part of your study. A key principle should be to establish professional equality among colleagues working together on the lesson study, regardless of their role in school. Jointly plan the first lesson you will teach (usually of a cycle of lessons, although it can be “standalone”). At this point think about protocols – for example how (and even if!) you will explain to the class why observers are in the room. And do you want formal feedback forms or notes with discussion? Discuss intended learning outcomes so you can then compare with actual learning outcomes as the study progresses (this includes what you expect to see/hear in the pupil feedback phase as well). Be clear about what you want the observers to look at – remember it is a focused lesson study, aimed at very specific areas and centred on just three pupils. The most straight-forward approach is for the teacher who originates the study to teach while observed by the two colleagues. Make sure that you set up some basic observation protocols and make sure that the observation is targeted on the learning of the three case pupils rather than the whole class generally. Ideally do this as soon as possible! This is another exciting part of the lesson study. Again, focused evaluation of the chosen pupils is absolutely key here. You can evaluate in any order but include case pupil feedback, observer feedback, and a look at pupil outcomes. Ideally this will lead to the next stage of the cycle –which will usually be working together with your lesson study colleagues to plan the next lesson or sequence of lessons in the study or, if this was a single lesson project (perhaps because of time constraints or a really precise focus), you might go straight to the final stage of the process and feedback the findings to other colleagues. This will be dependent on what is available or encouraged in your school. But do try to share your findings more widely with colleagues. The value of lesson study is that it allows you to look at a clearly defined and specific focus that will be of benefit to other colleagues and/or pupils. If your study is able to move forward the learning of three pupils, or a group of pupils, then why not 300! There are no hard and fast rules about how best to garner pupil feedback. You can use a variety of approaches, including the simple continuum feedback on a scale of 1 to 7 or similar. The pupils respond at three points during the lesson study – at the start, at some point during, and at the end. For example, if testing out research on memory, at the start students rate their confidence with revision and recall from 1 (low) to 7 (high). They repeat this during the lessons and then again at the end of the lesson study process. You can then interview the pupils to discuss their scoring, or leave space for them to write an explanation of their score. Other options are to briefly interview case pupils after the lesson – together or individually. Or try reflective journal feedback: at the start of the lesson study provide the case pupils with a small journal and ask them to write a reflection on each lesson linked to the study focus. Another option is a structured feedback sheet of key questions that you would like to be considered by the pupils. It will help your lesson study if you think around the following points and even better if you keep some kind of journal as you progress. Where do the chosen pupils currently stand in relation to the lesson study focus? Where are they are in their learning, why have they been chosen and what do you hope to achieve? How has the lesson impacted on the chosen pupils? How has the lesson impacted upon your teaching? What changes will you make to the next lesson? What impact do you hope the changes will make? How best can you elicit and disseminate pupil feedback? How far have you achieved what you set out to achieve? Teachers in a geography meeting were discussing one particular year 7 class and decided to focus on EAL pupils because the teacher mark book showed that pupil progress for this group was lower than for native speakers. It was decided to make this class the focus of a lesson study. A five-lesson cycle was decided upon to fit into one half-term. Three pupils were chosen to represent the ability range of the class. In the planning session for lesson one it was decided to use supporting worksheets that were a mixture of English plus each EAL pupil’s native language (using an available online translation tool). This approach was new to two of the teachers and afforded a good opportunity for collaboration, especially when identifying key advice to be put into translation. In a review of the first lesson it was noted how the use of translated phrases had helped the pupils to access the work and write at improved length. It was also decided to identify simple verbal “praise phrases” to use with the pupils. Before the next lesson the pupils were interviewed and asked to provide the teachers with simple phrases in their own language. This provided great amusement to the pupils as the teachers struggled to say (and recall!) such simple phrases as “thanks”, “well worked” and “hello” in languages including Romanian and Turkish. This approach was continued across the remaining lessons in the study. At the end of the study the review revealed that the EAL pupils had managed to extend the length of their written responses to make better progress in their learning. When interviewed, the pupils highlighted how positive it had been to hear the teachers trying to use simple phrases in their own language. This was then fed-back at the next opportunity to the whole staff for wider use. Roy Watson-Davis is head of history and politics at the Royal Hospital School in Holbrook. He is also author of the Creative Teaching, Form Tutor, and Lesson Observation Pocketbooks.